Managing editor David Donovan says this afternoon’s ALP leadership spill has Rupert Murdoch’s grubby hands all over it, and the stakes could not be higher. 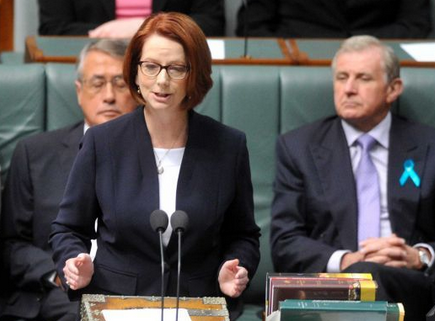 Simon Crean (right) looks for a suitable place in Julia Gillard's back. A Labor Party spill has been called for 4.30pm AEDST this afternoon. In an astonishing act of treachery, former frontbencher and one-time Labor leader Simon Crean took to the airwaves just before question time demanding a spill and announcing his support for Kevin Rudd. After months of white-anting by senior Labor figures – whom we can be pretty sure included Crean, chief whip Joel Fitzgibbon, Rudd himself and possibly also Anthony Albanese, accosting the media in the hallways of Parliament signalling their imminent intention to challenge, and months of repetitive stories to that effect in the mainstream media – it has finally happened. But why has it happened now? And why, when this morning it seemed certain Rudd did not have the numbers. 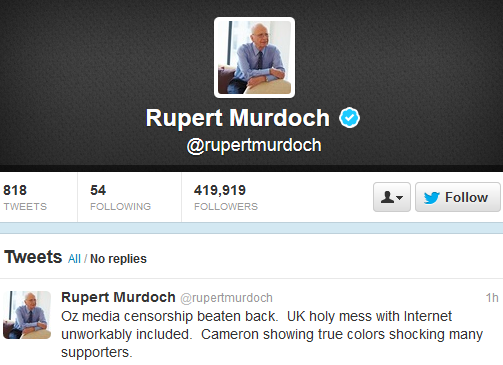 In my view, the talon-marks of Australia’s dark overlord, Rupert Murdoch, are etched all over this announcement. With media reform laws looking likely to have been passed today, it is almost certain he, or his local minions, overnight whispered beguiling words mixed with threats to Crean and others to force a spill today. The beguiling words would be the promise of fair coverage up until an early election if a spill occurs and the media laws are thrown away never to return; the threats — the Murdoch media unleashing the hounds of hell right up until a September 14 election. Tweet from Murdoch today, just minutes after the leadership spill was announced. We live in dark times where one evil old man apparently exercises such enormous sway over our “democracy”. Independent Australia is against party politics — and today’s events confirm just why we support decent hard-working Independents who represent their electorates, not party acolytes. Nevertheless, it is absolutely vital that Gillard wins the spill this afternoon. Honest politicians must hold firm against despotic media bullies and do what they know is right — despite the threats. If Gillard loses the vote this afternoon, the Independents will jump ship and force an early election. In the ensuing chaos, in six or so weeks’ time, Labor will be decimated at the polls. It will be like 1975 all over again. If Gillard wins, the rats will have been exposed, never to rise again; media reform laws may eventually pass, allowing a chink of sunlight to shine in through the shadowy Murdoch-Rinehart press cartel; and decent Australians will be able to live in hope that a regressive Tony Abbott-led Government may not, ultimately, be elected to put us back to the about 1950. Today is the day for honest politicians to come to the fore. However, it is never wise to put your trust in the honesty of politicians.